I hate offset feeds, just because it makes them so tall. No need for a ball stack with modern loaders. Trilogy ,hands down the simplest set it and forget....I was never one for fads...All other ACs should be Snipers anyways..
Ok, not quite but seriously idk what it is about his. Milling: Bonebrakes just look cool to me, organic looking I guess. Anno: the old PK finishes on classic Eclipse guns like Nitro fade or Bonsai splash. Internals: I have had the best consistency with Shocktech guts. My current sniper has been 285 +/- 5 for 5 plus years. Just a personal preference.... I started playing in the late 90's/early 00's and virtually everything was side feed, so I got used to that very quickly. I've always preferred to sight over the gun, and side feeds work very well for that. It's the way I aim thats a turn off for right or left feeds. I started after center feeds were the norm. I look and aim down the side of the marker. When a feed neck is in the way it throws me off. Like back bottle setups I can't aim them for nothing. I feel like I'm hip firing the thing every shot. I need to get behind the marker and look down the side to aim. Just personal preference i need to get it up to my eye to fire an accurate snap shot. I love seeing all the trilogy answers. Kinda makes my day, actually. The issue with cockers, as others have alluded to, is that it's all in the parts. A majority of bodies out there, including the absolute highest end bodies, were milled from wgp blanks. Spec wise, they're pretty much the same (depending on year of course). 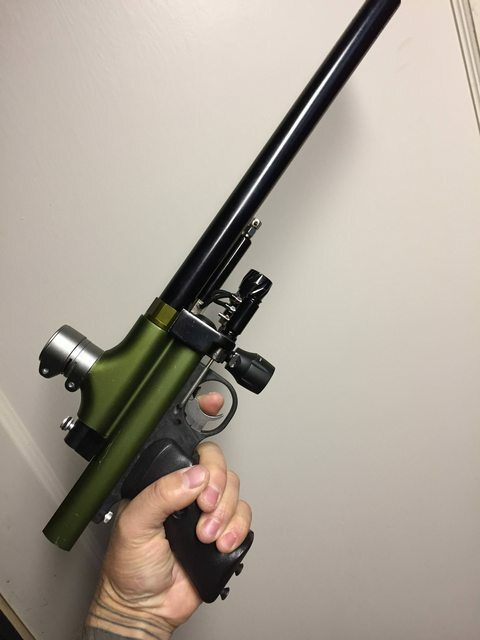 So you can take a base model, 2000 cocker and slap on the best parts and have the best cocker. The most sought-after guns would probably be Merlin/revenges, westwoods, and belsales evos. Twisters, rippers, P&P supercockers, and kapp flames are maybe one step below them. Since you mentioned krakens in the OP, i want to point out that they're just private-milled merlins. Guns like karnivors and dye reflexes are a solid step below that. Both in my experience are highly overrated. Reflexes especially; they look cool but otherwise are lousy guns. As with others, my personal preference is for trilogies. I'm kind of notorious for it. The first gun i bought myself was a trilogy comp, and to this day it's my favorite gun. I even ran it close to stock up until a year or so ago. It probably won't outperform an evolution, or a v2 revenge, but they're neck and neck with anything that isn't absolute top of the line. Last edited by magmoormaster; 01-12-2019 at 09:45 AM.